You have to be pretty controversial to be rejected from the Super Bowl. After all, when the money amounts are that high and the ads are that notorious, you have to be pushing the boundaries of good taste to get banned from the Super Bowl. However, a commercial from a conservative comedy website called “Jesus Hates Obama” has been rejected by Fox. Check out the banned commercial below. I’m not sure what’s more surprising, that Fox has banned a commercial or that a group like this could get the $2.3 million dollars together to get Super Bowl air time. Maybe a little bit of both. 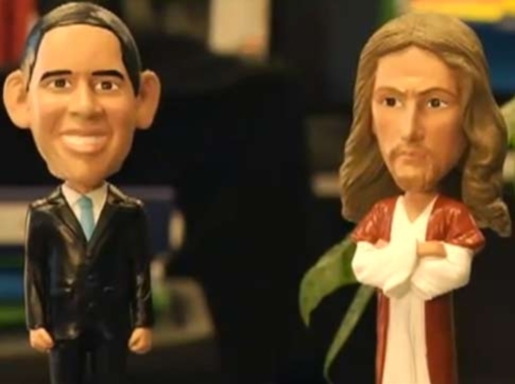 The website admits Jesus probably doesn’t hate Obama, and they also admit that it’s all in good fun unlike some other attack ads, but the ad, which features a bobblehead of Obama being pushed into a fishbowl by a bobblehead of Jesus, apparently didn’t make Fox officials laugh enough and it’s been removed from air. Given the uproar, I expected something a little more vitriolic and a little less cute.